I was recently chatting to a coach the other day (he shall remain anonymous) about self promotion and connecting with the audience. The conversation wasn’t necessary to do with Youtube, but definitely had some crossover moments. He was saying that he was producing content for his audience but found he was getting very little conversions. I asked him if what he was producing was what his audience wanted. He looked at me with the most puzzled face as though I’d said something taboo. The idea of asking the audience about content creation clearly didn’t go down well, especially when I suggested he should try it. To start things off, just throw out a message out on your social medias or mailing lists (wherever your followers are) and ask them plain and simply “What content would you like to see?” You may get responses, you might not, some may be private, some may be visible to others. In my experience, usually the ones who do respond are individuals who could be potential clients, your prospects. These are people who are on the fence about working with you and are waiting to see a particular piece of content to encourage them to work with you. By not producing videos on request, you could be missing out on business. However you feel about the idea of asking your audience for content ideas is irrelevant. One person I spoke to said that he felt that asking this would make him look weak. I can assure you that it’s the complete opposite! you’re demonstrating to your viewers that you want to provide a service that is worthy of them to watch. Why would someone want to watch videos of an individual who doesn’t listen,? and because they make videos they THINK the viewer wants, clearly demonstrates they don’t know their audience at all. Instead, become more open to the idea of at least hearing your audience out. They may come up with some weird answers, some might give you concepts you’d wish you thought of sooner. Either way you become more understanding and open to their feedback. Once your followers have expressed their ideas, thank them! you’re creating an online community with them, the least you can do is be grateful! you may be influencing them, but if they really like you and your service, they will be the biggest influencers of all to others. Even consider further brainstorming their concepts and if they’re really good, credit the users in those videos. This kind of positive reward can be highly contagious. viewers want to get more involved and if anything, take the pressure off of yourself when it comes to content creation. Now that you have the ideas and gained the interest of your audience, the only thing left to do is to create the videos. I like following the 80/20 rule that 80% of the video is your audiences concept and the 20% is how you plan to produce it. If you have a particular style of making videos, keep to that style. You are the artist, producer, director etc so you have full control over the videos to be uploaded. it’s not uncommon that some content creators cave under giving viewers what they want, because the thing is, sometimes your viewers don’t know how to execute the ideas, this part of the process is down to you. So I hope this has been useful for you, I plan to keep the consistency with my articles now that I’m almost ready to go full steam ahead with my own Youtube channel. In the meantime, I would love to know what you think about this article. 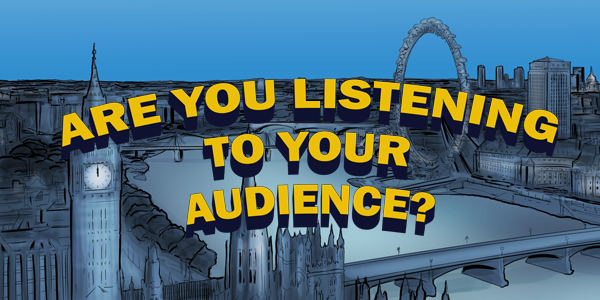 Are you someone who listens to their audience? or do you feel you know what your audience want without needing to ask? LEAVE A COMMENT BELOW!! !